A delightful selection of ladies ponchos wraps and shrugs, made from New Zealand’s eminent knitwear design houses. All made from a blend of possum fur, merino lambswool and mulberry silk with the well known and respected qualities of supreme comfort and warmth, sublime softness, yet durable and low pill. Incredibly easy to wear, these lightweight throw-on wraps, shrugs and ponchos are instantly elegant and especially useful for travel. This fashionable cape sweater features a roll neck and bat wing sleeves and looks great worn with a pair of jeans for everyday style this winter. Available in Ocean, Loft and Peacock. This flattering ladies longline coat cardi from Untouched World is made from their luxurious ecopossum blend and is available in Graphite and Zephyr. 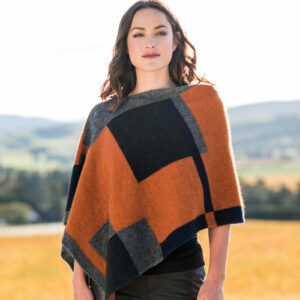 This generous wrap features a flattering geometric pattern and is made from a blend of possum wool and merino wool. Available in Stone Multi. 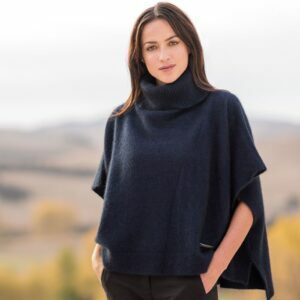 This luxurious wrap is elegant and versatile and is made in New Zealand by Merino Mink from a luxurious blend of possum fur, fine merino wool and silk. Available in Golden Pearl, Paprika and Zephyr Navy. 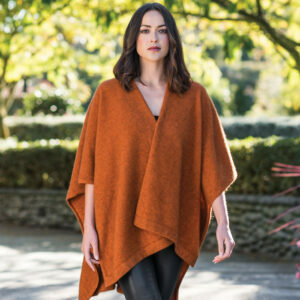 The ultimate in style and comfort, this elegant cape features mid-length sleeves and a deep roll neck. Made from a possum and merino blend. Available in Mist, Zephyr Navy Blue, Duke, Aloe, Stone, Royal and Paprika.